Educationists, Scholars, Policymakers, Teachers and a large number of students from different parts of the country took part in it.University Chancellor Dr. Zora Singh presided over the inaugural session. Speaking on the occasion, he said that the change in climate is a hot topic and we all have to do something in this regard. Giving more details Pro Vice-Chancellor Dr. Neelima Jerath said that Mr. Sanjay Ghosh from NABARD was the chief guest on this occasion, who encouraged all present to take each and every step to save our environment. Dr. Ram Bhoojh from UNESCO graced the occasion as Guest of Honour. Dr S. K. Saxena from Punjab State Council of Science and Technology appealed the farmers not to burn wheat and paddy stubble , it produces harmful gases which are extremely harmful for health and environment. The experts also briefed on the Projects taken up by India (in Punjab, Madhya Pradesh and Himachal Pradesh) under Green Climate Fund and National Adaption Fund for Climate Change. Delegates from 8 States like Punjab, H.P., M.P , U.P. , Uttrakhand, J&K ,Delhi and UT’s were also present and experts from Punjab University Chandīgarh, Punjabi University, Patiala , Punjab Agriculture University, Ludhiana ,Guru Nanak Dev University , Amritsar and PGI etc. also shared their views in the seminar. 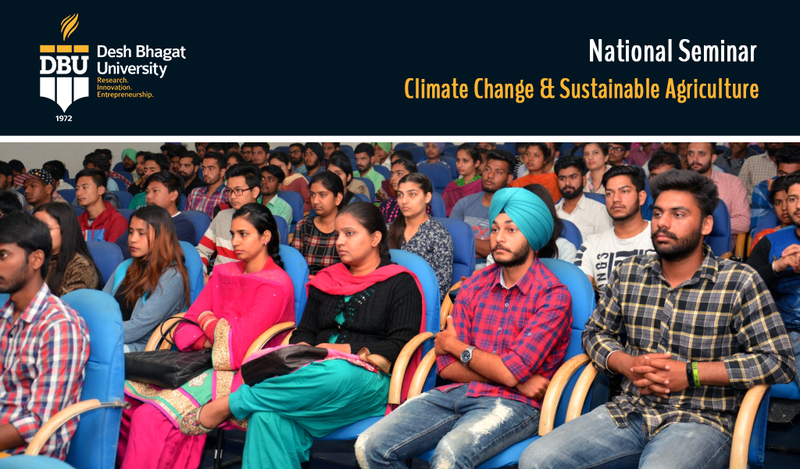 Five technical sessions were organised on various themes: Climate change and sustainable Agriculture: National and Regional Scenario, Climate change, Meteorology and Agriculture, Biodiversity and Renewable Energy, Industry ,Climate change and Health, Economy, Business and science. The seminar was also attended by progressive farmers of Fatehgarh Sahib. 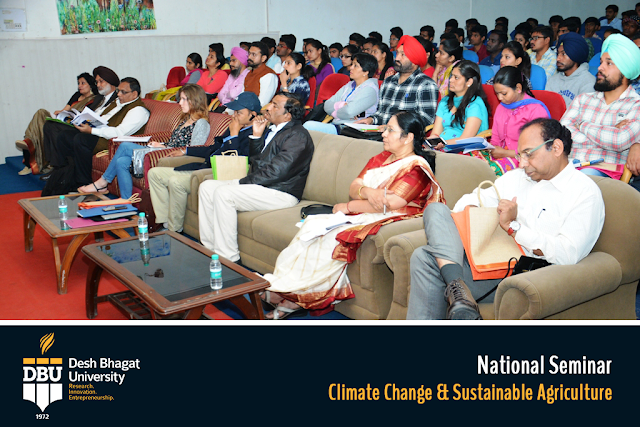 During the seminar, as many as 20 invited lectures were delivered by renowned scholars and environmental experts. More than 30 oral and poster presentations were made by research scholars, teachers and students hailing from different parts of the country. 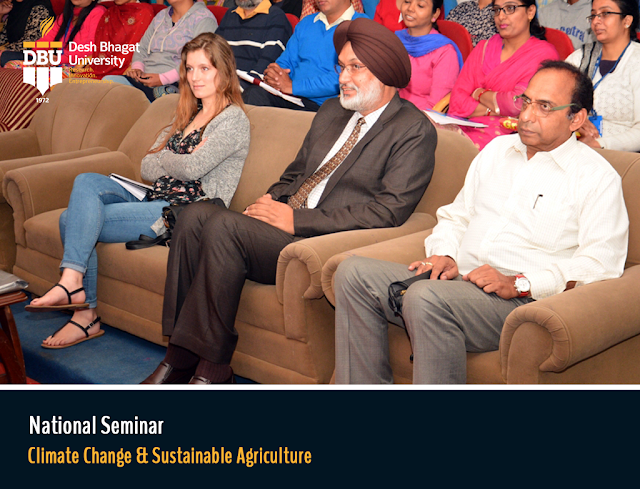 At the end of the seminar Pro Chancellor, Dr. Tajinder Kaur and Vice-Chancellor Dr.Virinder Singh thanked all the guests and expressed pleasure at the overwhelming response to the seminar and hoped that it will prove quite useful for the students, faculty members and policymakers. Director Dr. Surjeet Patheja, Dr. H. K. Sidhu, HoD’s and faculty members were also present on this occasion.